When you are pregnant, you need more protein, iron, calcium, and folic acid. But this doesn't mean you need to eat twice as much. Making smart food choices can help you have a healthy pregnancy and a healthy baby. Try fortified ready-to-eat or cooked breakfast cereals with fruit. Fortified cereals have added nutrients, like iron, calcium, and folic acid. Look for options with less added sugar. If you are feeling sick, start with a piece of whole-grain toast. Eat more food later in the morning. Eat foods with fiber. Broccoli and leafy greens contain most of the nutrients that pregnant women need. They are also rich in fiber, which may help prevent or treat constipation. Beans, like black beans and kidney beans.Legumes are great sources of folate, fiber and many other nutrients. Folate is a very important nutrient during pregnancy, and may reduce the risk of some birth defects and diseases. Sweet potatoes are an excellent source of beta-carotene, which the body transforms into vitamin A. Vitamin A is important for the growth and differentiation of cells in the growing fetus. Dried fruit may be highly beneficial for pregnant women, since they are small and nutrient-dense. Just make sure to limit your portions and avoid the candied varieties. Avocados contain high amounts of monounsaturated fatty acids, fiber, folate and potassium. They may help improve fetal health and relieve the leg cramps that are common in pregnant women. Whole-grain crackers with fat-free or low-fat cheese. Whole grains are packed with fiber, vitamins and plant compounds. They are also rich in B-vitamins, fiber and magnesium, all of which pregnant women need. Take a prenatal vitamin with iron and folic acid every day. Iron keeps your blood healthy. Folic acid helps prevent some birth defects. Talk with your doctor about a prenatal vitamin that’s right for you. Food that contains preservatives . Drink decaffeinated coffee or tea. Drink water or lemonade instead of soda. Don’t drink alcohol. No amount of alcohol is safe during pregnancy. What you eat during pregnancy affects your energy and well-being. It may also directly affect the health and development of your baby. Since calorie and nutrient needs are increased, it is very important that you choose nutrient-dense, healthy foods. Gaining weight during pregnancy is normal, but it is important to gain it the healthy way. This benefits you, your baby and your health after the pregnancy. 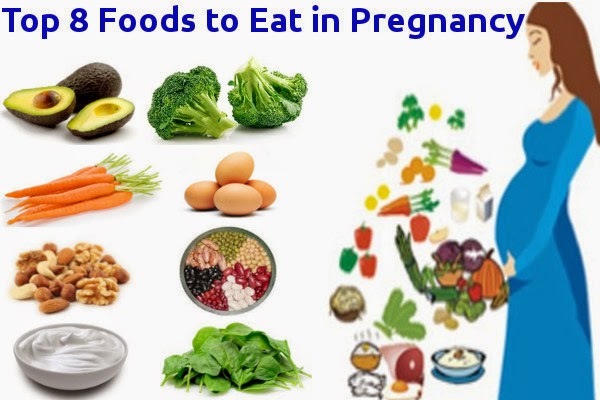 This list should be a good start towards a healthy, well-nourished pregnancy.